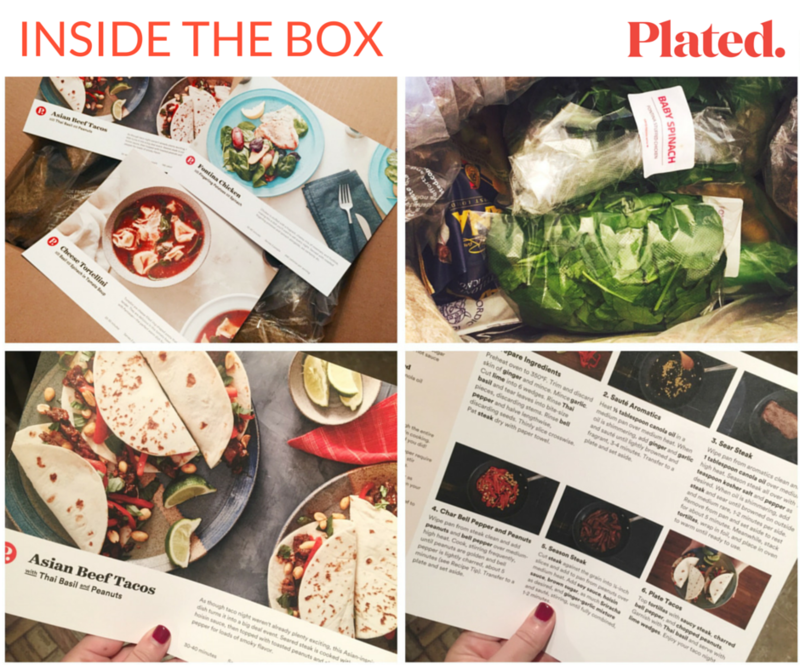 Disclosure: I purchased my own Plated box using a discount code I found online. One of the things contributing to my unhealthy eating habits is a lack of meal planning. To be honest, if Dan and I are both tired after work and don't have dinner planned, we order in... and it's just not a good habit! Not to mention, it's expensive. Since I do enjoy cooking, but have barriers laziness when it comes to recipe planning and grocery shopping, I decided to finally give a subscription service a try. In the past, I've tried recipe meal planning services (where you shop on your own, like The Fresh 20) but shopping for 2-person meals is kind of a hassle. I end up with ingredients wasted. I've also tried frozen meals (Dinner A'Fare) but found freshness and taste to be lacking. 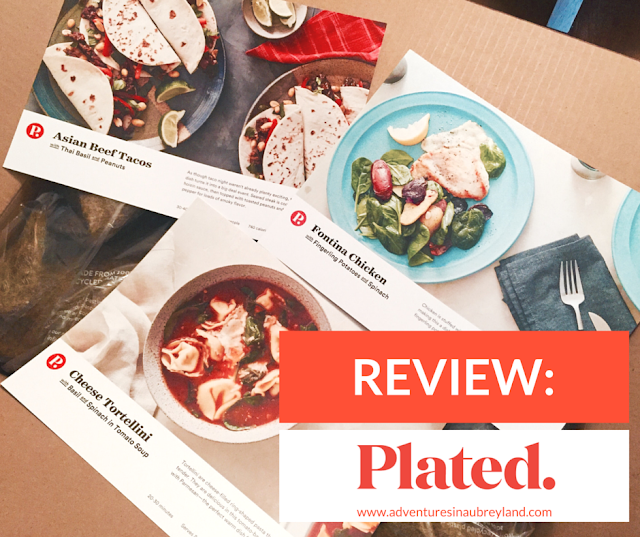 This time, based on a coupon, I went with Plated, for chef-designed recipes and precisely measured ingredients delivered each week. You go online (or into the app) and decide on your meal plan, based on number of dinners per week and whether they should feed two or four people. Then, up until just under a week prior to your shipment day, you can select your menu or choose to skip a week. I really like the option to skip a week if you're traveling or have plans, and the customer service folks were helpful when I made an error in my selections. I also LOVE that they have meals focused on feeding two people. On delivery day, they let you know when your box is coming, so you can bring it inside and get things into the fridge. Each plate is $12, so a meal for two is $24. Shipments over $50 are free, and there are some gourmet and dessert options too for extra $. For example, if you order 2 meals for two people, that's $48 with $6 shipping. But if you add an $8 dessert, you can get free shipping and really only pay $2 for the dessert. 3 dinners for two are $72/week. For my first box, I ordered three meals for two people. Now, I know what people are thinking. $72 a week for three dinners? That's not as cheap as going to the grocery store and planning more frugal meals. AGREED. But I found it to be good value for the money, as I'll explain in depth later. Think of it this way: recipe selection, measuring out ingredients, and delivery are all included. No tips to deal with either. And it cuts down on both dining out and grocery expenses in the grand scheme of things. The kit came with 6 tacos, to feed two people. We found it to be enough for three portions! Each box includes your meal kits and colorful and large recipe cards. I absolutely loved how everything was portioned and organized perfectly for Dan and me! Recycling enthusiasts may not like the packaging (most of these services offer help in recycling instructions) but I loved how each meal was bagged so cleanup was easier after I finished prep. 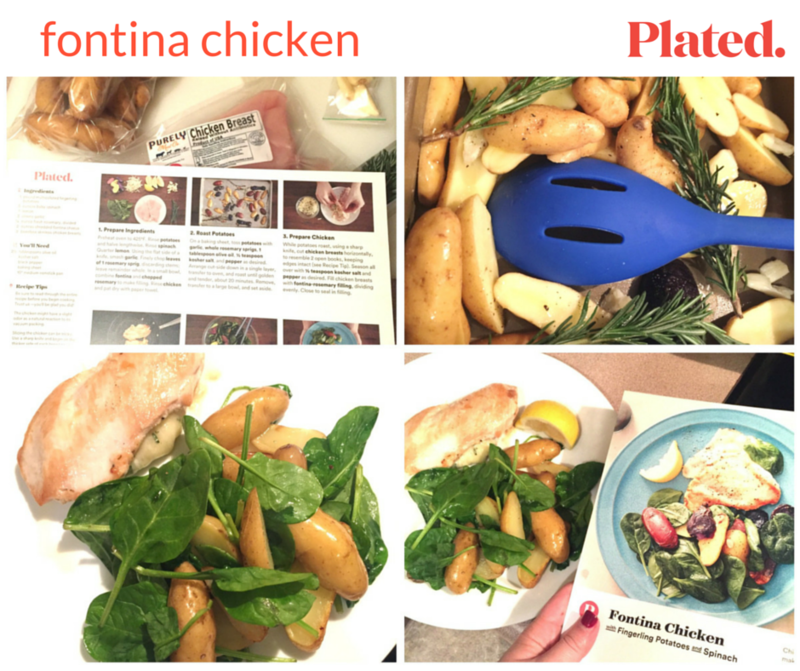 We found for this one the chicken fed two, but the potatoes had about 3 servings. Convenience & Time Saved: Not only are these meal kits delivered to you, but they're prepackaged/prepped for two people. You don't have to go out and do the math to buy a box of brown sugar or a carton of cream when you need a little for a recipe, or things like hoisin sauce. It's all there! And each meal only takes about 30 minutes to prepare, because the prep work is done for you. Portion Control: I've found that these meals contain 2-3 servings. I usually try to eat 1/3 of the meal, and leave the rest for Dan. Sometimes he has enough to take leftovers to work for lunch! The recipe cards also include calorie information. 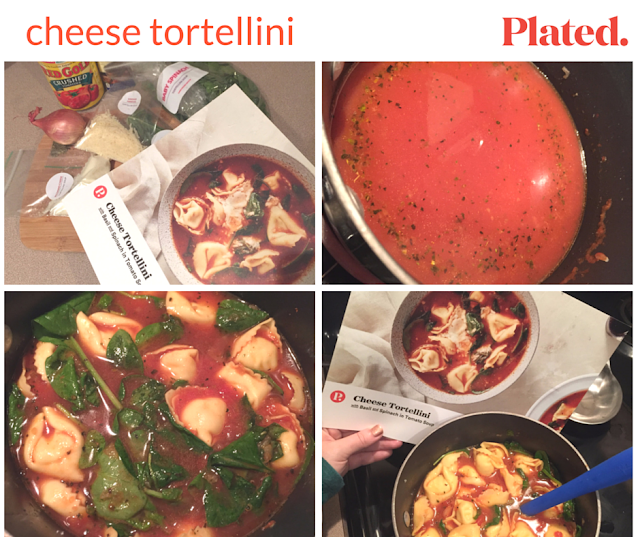 Variety: If I had the time and energy to cook all of the recipes I pin on Pinterest, I wouldn't need a service like Plated. I even tried things I don't normally choose to eat, and enjoyed them! And we never get the same meal twice, unless we want to take the recipe card and grocery shop to do it again. 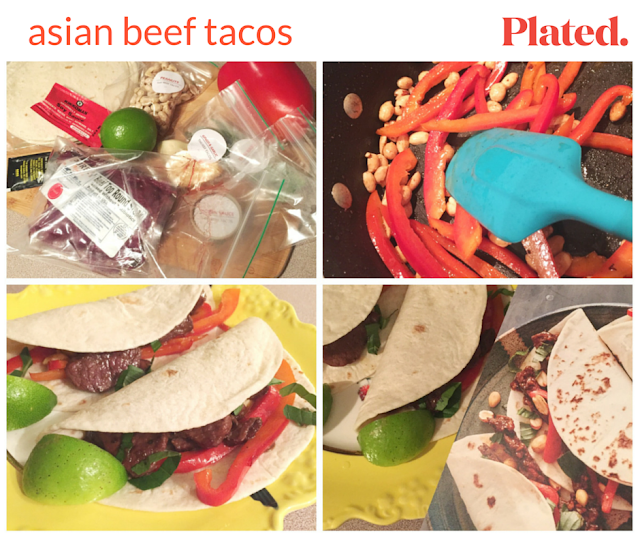 Fun: The recipe cards are huge, colorful, and have step-by-step instructions. I feel like I'm getting my own pre-packaged Food Network experience. I put on my music and prep the meal. I don't mind spending 45 minutes doing this in the evening. Tasty: All of these meals were tasty. Not every aspect of every meal is a slam dunk keeper, we felt like we'd eat all of them again. This provided us with three servings, and Dan went back for seconds! Because of this, I really found Plated to be good value for the money. To me, it replaces meals that we would have outsourced to fast casual restaurants, and we end up buying fewer groceries with these meals in our plans. Kind of a double-savings in a way, including gas. So while I don't think it's the solution for a budget-focused family, it works really well for a busy working couple like us. I really liked seeing how little food and ingredients we waste. I also think it would be a wonderful gift for someone who enjoys cooking but is low on time and energy! I think the ideal Plated user is someone who is a busy foodie and needs help meal planning to avoid defaulting to restaurants. She isn't as budget-conscious, and a good meal is worth the opportunity cost. She also enjoys making things she has never made before, including learning new techniques or trying new ingredients. Did I have any dislikes? Well, the box is kind of big. So we have to make a trip down the apartment stairs and over to the dumpster with it. But that's about the only issue I could find! I plan to continue purchasing a couple of Plated meals on weeks we are home, including trying some of the dessert options. I also ordered a Blue Apron (another service) box to try, from a friend who had a free one to share. Review and comparison to come, once I have cooked and tasted! From there, I'll probably choose one over the other. So far, it's been really enjoyable and something we both like better than previous meal-planning attempts.